What’s that one thing that you think of when saying Romania? Ok, most of you might say “nothing comes to mind”, some might say “Dracula, of course” and others would think about some not so flattering stuff for us Romanians. But keep on reading and I’ll help you link this Eastern European country to something that I like a whole lot: wine. The Romanian Wine road! From the cycle “where do we run from Bucharest” over the weekend or even for one day, one late September day I’ve chosen to explore something little known to me: the wine road in Romania. I knew that we have a lot of wines and vines, and I wanted to visit a winery for so long but somehow I didn’t manage to do it. Thus, one early Saturday morning, I jumped in my car together with 3 friends and headed to the closest part of the Romanian wine road: Prahova county. What is the wine road in Prahova County? Getting there: unfortunately, the only way of getting there and exploring the area to its best is by car. You can also opt to book an organized tour with wine tasting at one of the many wineries in the area. The wine road in Prahova County is the following: Filipestii de Padure – Floresti – Baicoi – Plopeni – Zamfira – Boldesti-Scaieni – Bucov – Varbila – Valea Calugareasca – Jercalai – Urlati – Ceptura – Mizil – Tohani. But we did not take the whole road, choosing to explore a smaller part of it and to have time to stop by at some of the cool mansions along the way. We left Bucharest and headed towards Valea Calugareasca and our first stop was at the Matac Mansion. The place is easily missed and you can pass it by without knowing that something so beautiful lies there, right behind the trees. From the main road, a country path leads you straight to the mansion. As we walked the deserted road, we were wondering if this is the right place or we are trespassing some private property and someone will chase us out of there. Once you turned left, the mansion’s roof welcomed us and we knew we were in the right place. The Matac Mansion was built in 1901-1903 on the Cantacuzino estate and it is currently closed and in a rather bad condition. I sure know I am not the only one wishing for this place to be restored because I am certain many more people would love to visit and maybe even rent a room here. But until someone decides to do something about it, the Matac Mansion remains a great location for wedding pictures (while we were there taking pictures, a bride and groom came by also). Driving further towards Tohani, our next stop was at Crama 1777 Museum, a reproduction of a small winery dating from 1777. GPS coordinates: 44.962860, 26.196626. I don’t really know what were my expectations with regards to this place, but we got a tour of the small wooden house where we got to see some old tools used in the winemaking process in the past, together with some cool Romanian vintage traditional clothing. We weren’t allowed to take any pictures of the inside museum, and I’m not certain the guide there speaks English, but the place is still lovely infused with a lot of traditionalism. Moving forward, our next stop was in Urlati, at the wonderful Bellu Mansion. We reached the museum after we managed to get lost on the hills, where we were surrounded by vineyards, after an intense autumn rain. I can’t say I’m sorry we managed to get lost, because from up the hill is where you get some of the best views there are. Conacul Bellu (Bellu Mansion) is a magnificent place with which I fell in love hopelessly since the first moments I lay my eyes on it. And that was just the entrance tower haha. The tower hosts a small museum, where we got to see some photo cameras dating from the XIXth century, used by Alexandru Bellu, the owner of the mansion, who was very passionate about photography (in an era when Instagram was not a thing). Next, we climbed a small hill through the woods and before our eyes, the small and charming mansion unfolded. I don’t have to add here that I was immediately smitten. The mansion is now a museum and can be visited by whoever feels curious, but at its time this was the guest house, the main mansion being destroyed during the Communist era. Even so, the house has many charming rooms, each being decorated in a certain style, with furniture brought from all sorts of places in the world: from Turkey to Japan. And what is even more cool about this little corner of Paradise, only 87 km away from Bucharest? You’ve guessed it: its winery and the beautiful garden. Unfortunately, we did not do what everyone else comes here to do (and what you should! ): wine tasting. But I sure have this on my list for a future experience! You can choose from one of the many amazing wines original from this area, but make sure to organize the trip ahead of time, and also take into consideration the fact that they only do wine tastings for larger groups. 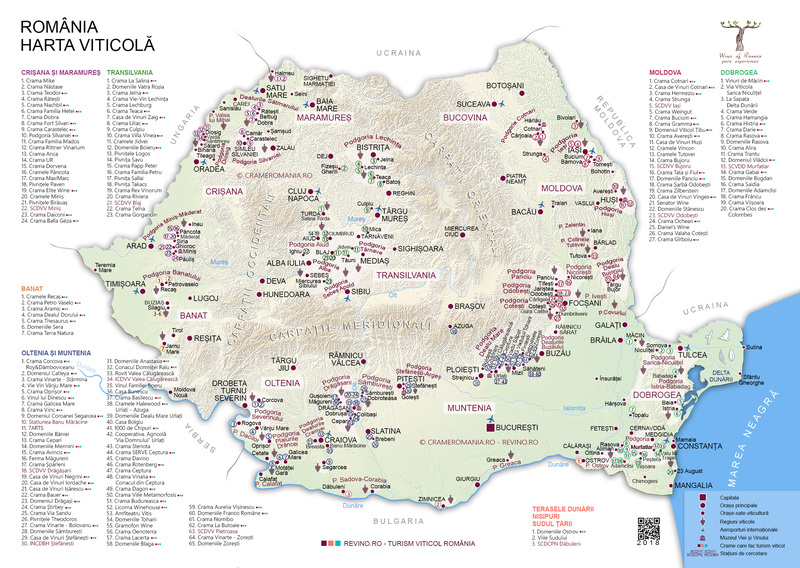 I had no idea Romania had so much wine! I would love to drive this wine road one day and try all the different kinds at the beautiful wineries. Thanks for the awesome post! We love doing wine trips, and now I’ll definitely be adding Romania to our list. It’s so fun to discover new wine regions and always the best scenery!